For over a decade, Crystal Dynamics have been the caretakers of the Tomb Raider franchise. In 2013, they created a new vision of the franchise’s iconic character, Lara Croft. Rebooted as a darker, grittier survival game, Tomb Raider explored Lara’s transition from mild-mannered Englishwoman to a cunning queen of the wilds. While the game wasn’t without missteps, it was a solid first entry in a new trilogy and an interesting take on a largely underdeveloped character. That’s why 2015’s Rise of the Tomb Raider was a bit of a step back. The second entry in the trilogy did little to evolve the heroine, aside from overindulging in derivative exposition. So it’s perhaps strange to see Eidos Montreal, developers of the two modern Deus Ex games, in the driver’s seat for the final chapter of Lara’s new trilogy, but perhaps it is for the best. While Shadow of the Tomb Raider isn’t a slam dunk, it’s nice to see the series revisit the deconstruction of its protagonist. Still entrenched in her ongoing battle with Trinity organization, Lara begins the game in Cozumel, Mexico trying to outwit her adversaries in a race to their latest macguffin. Said macguffin turns out to be an ancient dagger that upon being removed from its resting place triggers a series of cataclysmic events. The leader of Trinity, Dr. Pedro Dominguez, encounters Lara and grows terrified when he realizes that she removed the dagger without first having the special container, required to hold the dagger without causing the end of the world. Thus begins a race against the clock to find what the characters constantly refer to as “the box” before the world ends or Trinity gets it first. The journey leads Lara to another lost civilization in South America (much like in Rise of the Tomb Raider) where she encounters an isolated group of natives who are in the midst of a civil war. Between this and the previous game, it seems like neither Crystal Dynamics nor Eidos Montreal can really think of a way to tell Lara’s story without inserting her into someone else’s narrative - usually with a cast of uninteresting and dispensable characters. The new trilogy has largely been playing catch-up to Naughty Dog’s Uncharted series and the supporting cast is a big reason why. Whereas Uncharted has plenty of fun characters to bounce off of each other - Tomb Raider always seems to stick Lara into a group of blank slates who only seem to exist to exposit about whatever treasure she’s hunting, and warn her of what she will face. There’s less to connect with and less to enjoy. That being said, there is more development to Lara this time around. Having thoroughly overcome her self-doubt, Shadow of the Tomb Raider wonders if maybe this life has turned Lara into something of a dare-devil and thrill seeker - someone more obsessed with treasure than the people who help her find it. It’s something the one strong supporting character, Jonah, calls her out on. It’s nice to see that kind of reflection on the titular character, even if it isn’t as explored as thoroughly as one would hope. The game also has a much better tone than the previous entry. In the original, Crystal Dynamics paid homage to the nasty horror classic The Descent, and Shadow of the Tomb Raider gets back to some of that visceral combat and gruesome suspense. At one point, the game’s tone darkens and some of those horror elements return. Also, watching Lara, smothered in mud, splattering the screen with blood as she slices throats open, has a very grindhouse feel to it and it’s in these moments that the Tomb Raider series feels the most on-point. But much like Rise of the Tomb Raider, the best thing about this third chapter is the gameplay. It also might be the one spot where the series actually overtakes Uncharted in my eyes. The survival aspects of the game have turned Tomb Raider into more of a stealth game with Lara moving nimbly between cover locations, systematically and silently taking out her enemies. It makes the encounters much more thoughtful. The new mud mechanic is nice addition, allowing Lara to cover herself, then blend into vine-covered walls. It adds a much needed new element to stealth aside from perching up above and crouching in bushes. All of this limits the amount of shoot-outs you get into, which is refreshing. I could count on one hand how many times I got stuck behind cover in a firefight. Shadow of the Tomb Raider puts an added emphasis on stealth and tactical combat by limiting ammunition for weapons - sometimes leaving you with nothing but Lara’s bow and knife. The enemy AI is a little weak, enemies tend to follow predictable patterns both in stealth and in combat. In the few cases where you do have to start shooting, the weapons feel great. Tomb Raider has always boasted one of the best bows in video games, but even when you have to switch to a pistol, assault rifle, or shotgun they still feel great. There is a particular sequence when you’re forced to use the shotgun to kill a series of rushing enemies that plays really well. Even when you do get into shootouts, you can duck back into cover - though some of the combat arenas aren’t big enough to facilitate this. The other strong aspect of the gameplay is the traversal. This trilogy has always been good at coming up with clever and inventive ways to explore the world and Shadow of the Tomb Raider continues to excel in these aspects. In addition to previous mechanics, wall-running returns and a new rappel feature has also been added. There’s a lot of spelunking in the new game and these mechanics work well to compliment this. Weaving my way through cliffsides, diving into dark caves, and swimming through dangerous rivers has never been more enjoyable. You'll also have the experience system, and various skill trees to work though to get new skills and improve your deadly abilities. My one knock against the gameplay would be the swings in difficulty. Playing the game on normal, I found most of the story puzzles to be exceedingly simple, while the challenge tombs were crushingly complex. There are a handful of these challenge tombs that can be found while exploring and some that are available outside of the game in the “Challenge Tomb” game mode. These difficulty swings also apply to the combat which ramps up mid-game, but is pretty forgiving in the climactic battle. These issues don’t derail Shadow of the Tomb Raider, but they stuck out to me while playing. Consequently, one of the best things is how Shadow of the Tomb Raider allows you to customize the experience. Combat, puzzles, and exploration all have their own difficulty settings, so you can customize the experience to the way you want to play. The design of the campaign is similar to Rise of the Tomb Raider, with the majority of the game based around one large hub world, Paititi, a lost Inca city. At the hub you’ll be given side missions, can hunt around for collectibles, and trade with merchants. Merchants provide new weapons, outfits, and crafting materials. The weapons are a little weird because as you progress through the game you’ll be upgrading the weapons you already have, so starting from scratch with a new one doesn’t make a lot of sense. The outfits are better as each top and bottom provide different bonuses so you’ll want to switch things up based on whether you’re getting ready to fight Trinity or hunt for materials. The materials needed for crafting, upgrading weapons, and “restoring” outfits (something you have to do after purchasing outfits before you can use them) can be found anywhere and are quite plentiful. It keeps the survival and exploration themes alive while not being annoying. 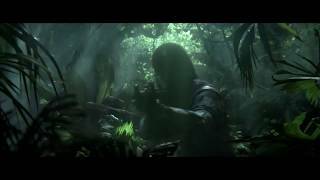 Visually, Shadow of the Tomb Raider, is a bit mixed. The vistas and environments look stunning. There’s a lot of beautiful green jungle to explore and the game changes up locales enough to not get boring. It feels like a brighter and more colorful game than Rise of the Tomb Raider and that helps a lot. The horror elements also help set a visual tone, as gruesome creatures and bloody corpses help add much-needed suspense to the story. Largely, the art design works. Paititi feels like a fresh take on a lost civilization and the South American locale is well chosen. That being said, the game does look a little cheap at times. I pointed out in my Rise of the Tomb Raider review that these games tend to use a lot of stock models and it feels worse here. There were a few times when I thought I might be re-tracing old steps because a rock formation or ruin looked exactly the same as another I had seen. You can also tell who is going to be important to the story based on how good the character model is. The main cast looks great, and there are some subtle facial animations that are excellent. Meanwhile anyone who doesn't speak in more than one scene looks flat and robotic. Another issue is some of the technical hiccups I encountered. A day one patch is incoming, but there are more issues than the ones being addressed in this patch. Most of these involve the already stilted animations, like in one cutscene where Lara seemed to glide instead of walk for a moment. Also after exiting a couple combat sequences, the music wouldn’t transition back to exploration because there was an enemy that failed to spawn or got stuck. I could hear it snarling and growling, but couldn’t see it. These were weird, but limited instances, not consistent problems. 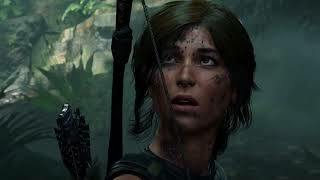 There are some issues with Shadow of the Tomb Raider, but largely I felt it was an improvement over the last entry in the series. 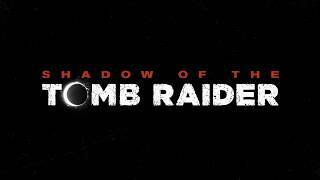 In all three of these games, Crystal Dynamics and now Eidos Montreal have found creative things to do with the cinematic stealth-action formula, and expanded on those mechanics time and again. In Shadow of the Tomb Raider, they continue that tradition and hone in on a well-paced adventure that is a fitting climax to Lara’s journey. The story can be a little hit-and-miss, with the highlights being Lara’s personal growth and internal exploration, but it’s told in a fun location with great gameplay backing it up. Push through the rough spots and you’re bound to have a blast in the conclusion of the modern Tomb Raider trilogy. The art design might be the best of the trilogy with beautiful locations and excellent facial capture, but there are still a lot of stock models and rough animations. Climbing, fighting, crafting, and hunting - there’s so much Shadow of the Tomb Raider does and so much of it feels really good. The new mechanics of using mud and vines to hide, repelling, and difficulty modifications are well implemented. This is a more intriguing yarn than the previous game and has better pacing. Still, there’s too much focus on the story of the world Lara’s stumbled upon which is far less interesting that her own growth. There were some hiccups while playing, but they don’t get in the way of the fun. The stealth mechanics and fun world traversal in Shadow of the Tomb Raider make it a great game. Whether Lara is smothering herself in mud to shank enemies and return to the shadows, rappelling down into gloomy caves, or blasting creatures with her powerful shotgun, this game has a grimy edge that makes it well worth playing.